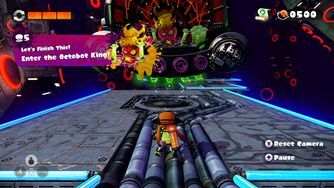 Enter the Octobot King! is the fifth and final boss mission in Splatoon's single-player mode, Octo Valley, against DJ Octavio, leader of the Octarians. After completing every previous level in Octo Valley, the Boss Kettle on the UFO floating above Octo Valley will be unlocked. At the very top of Area 5 is a Launchpad to Super Jump to the UFO, which will fly off into the sky when Agent 3 enters its Boss Kettle. Octorpedoes - airborne Octopods shot out from the four cannons on the front. They home in on the player, but can easily be evaded or destroyed. They spread a small amount of ink if they land. First, DJ Octavio will send out two Octorpedoes at a time which can easily be avoided by hiding in your ink. Eventually, one of the fists from the machine will be fired at you. If you carefully watch DJ Octavio's hands, you can see which one is going to punch you next, as it will rumble. As soon as it fires and is in range, shoot ink at it until it reverses into DJ Octavio. Strike him three times and he reveals a large octopus-shaped missile. Fire at this and he will punch it back at you. Repeat this two more times and a Launchpad will appear to take you to the next phase. The bomb will gradually get faster each time, especially in the later phases. DJ Octavio will now throw both fists at once, as well as shooting the Octarian version of the Killer Wail every so often. Boxes containing armor appear on various platforms. The Sunken Scroll for the boss is in a small box on the third platform. In order to get close enough to DJ Octavio to fight him, you must use the Propeller Lifts to get to other platforms. While it is possible to get very close to the machine, it is not recommended to do so, since all attacks will be harder to defend against and his barrier will stop you. Shoot his fists back at him six times and he will release the missile. Once you send the missile into his machine three times, another Launchpad will appear. Along with the increased amount of Octorpedoes being shot at a time, bombs resembling disco balls will also be thrown and will spawn Octocopters and Octobombers if they manage to hit the platform. Some platforms are invisible and require you to shoot your ink to proceed. To reach higher platforms, you must use Gushers. Continue to repeat the main strategy in the previous phases. The enemy bombs will now only spawn Octoballs, and four Octorpedoes will be shot at a time. DJ Octavio will shoot lasers every few seconds. Platforms are now noticeably narrower and therefore harder to avoid DJ Octavio's many attacks. There are common Balloon Fish to spread ink all over the platforms and hide from attacks. Continue to repeat the main strategy in the previous phases. After the Squid Sisters override the boss music and Cap'n Cuttlefish sets himself free, DJ Octavio becomes extremely aggressive. Only one enemy-spawning bomb is fired at a time, spawning a Twintacle Octotrooper, and large amounts of Octorpedoes are fired over time. There are Inkrails connecting each platform. The final missile requires quick movement as it is at its quickest speed. Once you reverse the missile three times, DJ Octavio will eject from the machine. Shooting your ink at him will thrust him back at his machine, ending the battle. Ink as much ground as you can so that you can dodge attacks easily. Try and burst Octavio's enemy-spawning bombs before they hit the ground. Collect lots of armor. When getting to the last few sections, damage boosting may be a good option if a player is bad at multitasking. Hero Charger Replica blueprint from the Inkling Girl amiibo. Hero Roller Replica blueprint from the Inkling Boy amiibo. Hero Shot Replica blueprint from the Inkling Squid amiibo. The massive, octopus-shaped bomb fired at the end of each phase is wearing a pair of shutter shades. The dialogue for this mission differs significantly between the North America and Europe/Oceania versions of Splatoon. During the first part of the mission, DJ Octavio fights the player normally, but when the Calamari Inkantation starts to play, he abandons his turntable to dance around. At several points in the song, he strikes a series of poses and laughs, which may go unnoticed due to the general mayhem of the battle. After completing the mission for the first time, a special Inkopolis News episode will be seen, and the Plaza will be at nighttime. After that, Splatoon's credits will be seen. Afterwards, the title screen will show and it will be daytime again. If the player goes back to Octo Valley, Cap'n Cuttlefish will talk to them and DJ Octavio will appear on the overworld in a snow globe-like tank. Subsequent playthroughs of the mission will have altered dialogue, describing a scenario in which DJ Octavio has escaped and recaptured Cap'n Cuttlefish. This is the only Octo Valley mission to include speech from both Cap'n Cuttlefish and Agents 1 and 2. Two Canned Specials, an Inkzooka and a Bubbler can be found. The octopus-shaped bomb with its pink shutter shades. DJ Octavio dancing to the Calamari Inkantation. The second set of poses. At the end of the mission, Octavio's helmet simply clips through the platform. The Great Zapfish as it appears in the level. DJ Octavio trapped inside a snow globe-like tank. The regional differences in dialogue. the coming of the Octobot King! Spanish (NOA) ¡DJ Octovius en el Octotrón! DJ Octavio in the Octobot! Spanish (NOE) ¡Baile final contra el Pulpotrón! The final dance against Octobot! This page has been accessed 54,293 times.